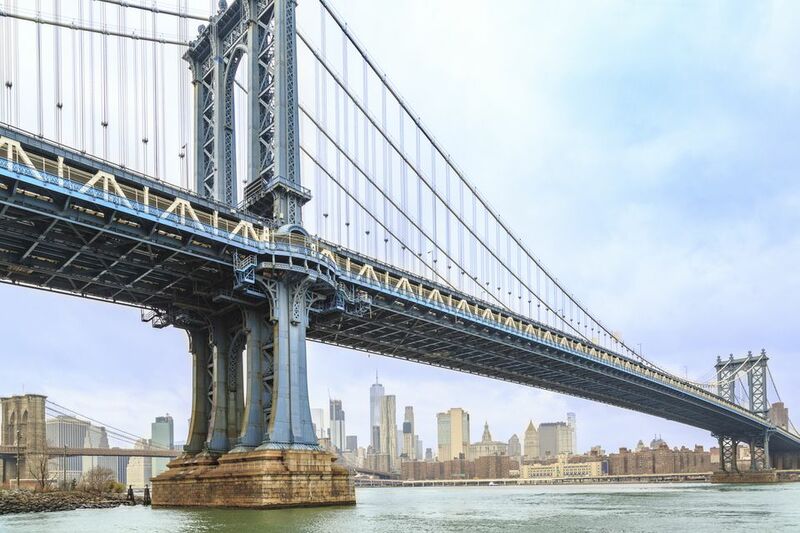 The Brooklyn Bridge might get all of the glory, but the nearby Manhattan Bridge, likewise traversing the East River between southeastern Manhattan and Brooklyn, is not to be overlooked. Opened since 1909, this graceful, century-old suspension bridge offers a break from the tourist crush on the Brooklyn Bridge while proposing similarly stunning views of New York Harbor and lower Manhattan, with the bonus of the Brooklyn Bridge in the foreground of it all. Here's everything you need to know about the Manhattan Bridge, from its history to how best to cross it. The steel-towered bridge's construction began in 1901, and it was officially opened to the public on New Year's Eve, 1909. It was the third of the three bridges currently spanning the East River between Manhattan and Brooklyn today, following on the heels of the Brooklyn Bridge (1883) and Williamsburg Bridge (1903). Its design was based on the then-new engineering concept of "deflection theory," an idea developed by Austrian engineer Joseph Melan and realized in the bridge's development by Latvian-born Leon Moisseiff, the chief engineer on the project (who went on to assist in the engineering behind San Francisco's Golden Gate Bridge). The Manhattan Bridge measures 6,855 feet in length, including its approach (its main span measures 1,450 feet); 150 feet wide; and 336 feet high (including its towers). Its center rises 135 feet above the water below it. The cost to build it was $31 million in 1909. Every weekday, 450,000 people cross the bridge (the majority transit by subway). Whether crossing the bridge by car, train, bike, or foot, you're guaranteed Manhattan views to remember. By vehicle, there is a double-deck motorway, with 7 lanes of traffic (four top lanes, and three bottom lanes, the latter of which are reversible to accommodate traffic flow) -- some 80,000 cars cross the bridge each day. There are no tolls to vehicular traffic crossing over the bridge. The bridge is accessible on its Manhattan side from Canal Street, in Chinatown (not far from the Canal Street subway stops). The pedestrian entrance is at the juncture of Canal and Forsyth Streets. Cyclists enter at the Bowery, via the Division Street detour. The Manhattan approach is marked by an elaborate, landmarked stone archway, colonnade, and plaza -- what is perhaps the most beautiful bridge approach in the city. Completed in 1915, and fully restored in 2001, the white granite was modeled after the Porte St. Denis in Paris and St. Peter's Square in Rome, and designed by Carrère and Hastings (the architectural firm behind the main branch of the New York Public Library).